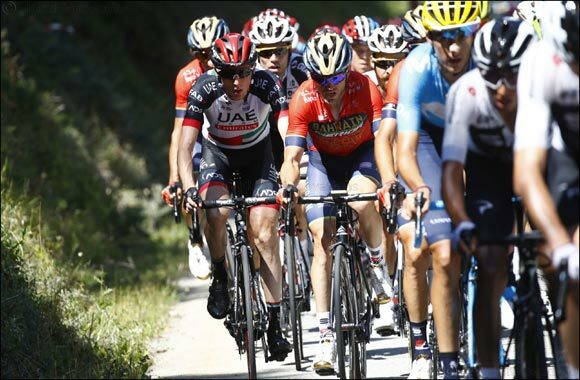 Dubai, UAE, July 22, 2018: UAE Team Emirates’ Dan Martin suffered a puncture in the final kilometre of Stage 14, hampering the Irishman’s chances of keeping with the General Classification (GC) contenders as they crossed the line. However, despite the bad luck, Martin retained his position in the top 10 of the overall GC standings, falling just one place to tenth. The race was won by Omar Fraile (Astana Pro Team), who put in a late attack to take home his fir ever Tour victory. Tomorrow will see riders head for the Pyrenees and the last of the mountain stages as they tackle a 181.5km route from Millau to Carcassone. Two early categorised climbs could test the peloton and anyone who is feeling the strain of the previous stages may find themselves fighting to stay in contention. If those two climbs don’t split the peloton then the final one, the Pic de Nore - a 12.3km category one climb with an average gradient of 6.3% - certainly could. There will be a long descent before riders hit the flat finish in what may be a thrilling end to racing before Monday’s rest day.